Volunteers work on the perimeter fence of the Mesa County Libraries People’s Garden, Friday, May 11, 2018. 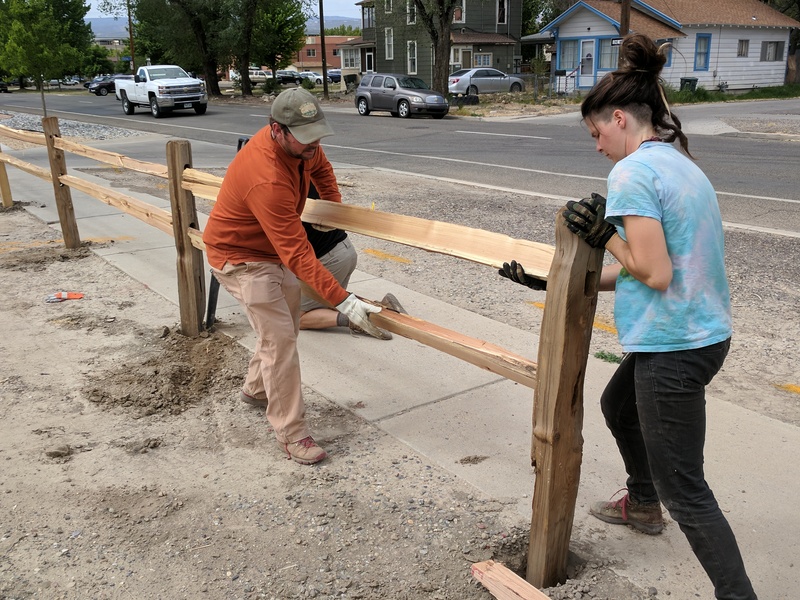 Volunteers on Friday, May 11, began building a perimeter fence and cleaning up the future site of the Mesa County Libraries People’s Garden. The garden, which will occupy library-owned ground at Fifth Street and Chipeta Avenue in Grand Junction, will be a place where volunteers and organizations join up to create and maintain a beautiful space for learning and growing. Tentative plans include a xeriscape low-water-use demonstration garden, a children’s garden, a community food plot, raised bed demonstration gardens, perennial flower beds, a shade ramada, benches, a shed, and compost bins. The library is seeking grants and assistance from community partners to fund and build the project. The People’s Garden won’t offer gardening plots to individuals. Instead, the community food plot will be used to grow food crops for donation to local organizations such as food banks. The garden also will serve as a location for education programs, quiet relaxation, and general enjoyment. Mesa County Libraries view the People’s Garden as an exciting way for interested people in the community to become more involved in gardening and as a place for the public to learn about different gardening techniques and outdoor-related topics. Anyone interested in volunteering or assisting with the People’s Garden may contact Nicole Fitzgerald at Mesa County Libraries, 970-683-2432, nfitzgerald@mcpld.org. Posted in General, Library News.